Getting started with dynamic pricing can feel overwhelming. There are loads of options and functionalities, which can lead to choice overload. In this post we'll cover each step briefly, but for more information be sure to check out the corresponding blog post for each element. To start, define what you want to achieve with your company or category. This is called your commercial objective, and it’s an explanation for why your company exists and what customers can expect from your organization. Some retailers have a clear market penetration strategy to capture market share as their company objective. Other retailers offer value-added services such as free quick delivery, great customer support, or long payment periods. Regardless of what your offer is, you should understand it thoroughly before starting dynamic pricing. The commercial objective is, in many ways, a compass for your business, and will help you form a dynamic pricing strategy that helps you reach your specific goals. Take time to develop your commercial objective, and make sure all stakeholders have the same understanding of your goals. The second step towards dynamic pricing is to determine your pricing strategy. A pricing strategy uses your commercial objective to make smarter pricing choices. In other words, it makes your commercial objective possible through the power of your product pricing. For example, if your commercial objective is to increase visibility but also capture profits, you might want to follow the “high-runner” strategy commonly used by Amazon. In this strategy, you draw traffic to your store through extremely competitive prices on a small selection of your most popular products while capturing margins on your less-competitive products. It’s counterintuitive, but once visitors are in your store for one specific product, they’re less likely to navigate away for a smaller, less popular product. Easier to implement. When you know what you want, and how you want to achieve it, it’s easier to get started with dynamic pricing. Easier to evaluate. If you know your goal, you can keep track of how your dynamic pricing strategies move you towards that goal. Think about what you want to achieve, and how you want the public to view your company, and how it’s linked to your prices. These pricing methods aren’t mutually exclusive, and it’s likely you’ll use a combination of these methods to create your own unique strategy. Choose what is necessary to implement the chosen pricing strategy. For instance, with a price penetration strategy you could undercut certain competitors (competitor-based), while staying above a certain margin level (cost-plus). Following on from selecting the pricing methods, we now create implementation ready pricing rules. If you choose to price based on elasticity, you let the algorithms make most of the decisions and there is less to set up in the pricing rules. Choosing the products can be anything from a category, stock, or whatever data you have. For instance: “for OLED televisions with a stock >10, apply pricing rule X”. Now that we have the products, we can make an applicable pricing rule, which would fill in “Pricing rule X” in 4.1, for example: “follow average of competitor X & Y” or “price based on price elasticity”. On completing steps 1 to 4 for all products under your management, you are ready to implement them into your pricing system. 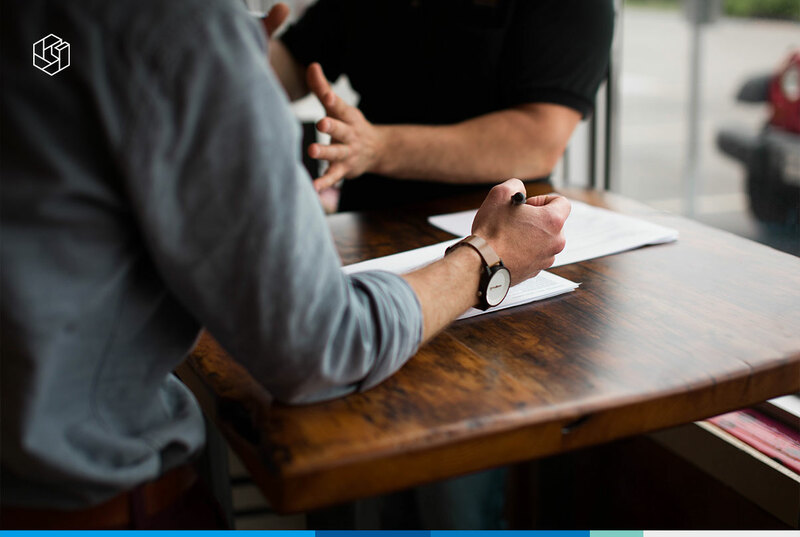 For validation purposes, be sure to ask colleagues to check the implemented pricing rules and make sure they match the pricing strategy and methods. Before going live, you should go through a robust testing phase to verify you have implemented the correct pricing settings. It is important to check whether your pricing strategy is applied correctly, so you can be sure the system is actually doing what you intended to do. A good automated pricing system should never be a black box, all decisions should be transparent in order to trust the system. After going live, it is important to monitor the pricing strategy and evaluate if it is helping you reach your objective. If your goal is to capture more market share, but are not able to increase your volume of units sold or your overall sales, it might be time to re-evaluate the objective. To conclude, a clear commercial strategy and objective is essential input for a good Dynamic Pricing implementation. It helps setting goals and keeping track of reaching those goals. 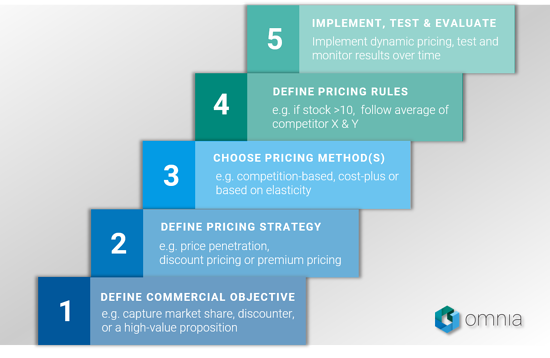 We recommend a five-step approach to go from your commercial objective to a successful dynamic pricing implementation. However, it’s worth noting that you should create different dynamic pricing strategies for different categories because the nature of consumer shopping changes across products. This is where a software like Omnia is useful: it helps you manage every product in every category and intelligently adjusts prices when the market changes. Want to try out dynamic pricing for free? Click the button below to sign up for a free two-week trial of Omnia.